Playoff hockey. 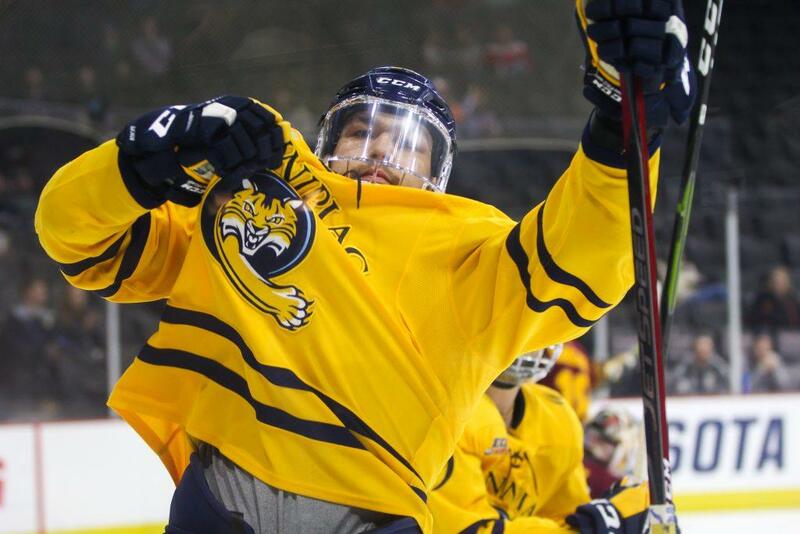 There is simply nothing like it… And for the Quinnipiac men’s ice hockey team (26-9-2, 14-6-2 in ECAC Hockey), they certainly got a full dose of what playoff hockey is all about, earning a hard-fought win over the Arizona State Sun Devils (21-12-1, Independent) by a score of 2-1 in the Midwest Region semifinals. The Bobcats did not take long to get out in front, as sophomore winger Joe O’Connor found the back of the net with a five-hole shot from a difficult angle just four minutes into the game. Being a Hamden, CT native, scoring the goal meant even more to O’Connor. This may have not been the prettiest goal of the season, but it was imperative for Quinnipiac to get pucks to the net early and often, a strategy most teams try to execute in the postseason. Quinnipiac head coach Rand Pecknold’s pre scouting of Sun Devil net minder Joey Daccord made it clear that it was going to be very difficult to get pucks past him, so they needed to look deeper into ways to beat the Mike Richter Award finalist. Quinnipiac was able to implement this plan in the second period as well, when freshman center William Fallstrom banged home a rebound off a shot by junior winger Alex Whelan, giving Quinnipiac a 2-0 after two periods of play. The third period is where this game really got interesting. It is safe to say Quinnipiac was the sharper team through two periods, but the final twenty minutes was most definitely a test. At 11:42 in the third period, Sun Devil junior defenseman Brinson Pasichnuk got his team within one, firing a wrister past Andrew Shortridge. This goal provided ASU’s bench with a much-needed spark, as they displayed some serious desperation for the rest of the game. While there was no debating the Sun Devils’ hunger to keep its season alive, it was the team’s lack of discipline that may have costed them the game. With less than five minutes remaining in the game, and Quinnipiac struggling to weather ASU’s offensive storm, Sun Devil defenseman Jarrod Gourley received a major penalty for a hit from behind on Bobcat forward Nick Jermain. This penalty certainly aided Quinnipiac in holding on for this one, as they pulled out the 2-1 win. As for Arizona State, this is just the beginning for them. The program is only in its third full season as a division 1 program, and already has gotten themselves some national recognition. While the Bobcats were able to prevail tonight, the road ahead does not get any easier. In what should be a very competitive contest, Quinnipiac will take on the defending-champion Minnesota-Duluth Bulldogs, a team with many high-end players up and down the roster. Tune in tomorrow at 6:30 P.M, as the Bobcats look to punch its ticket to the 2019 Frozen Four in Buffalo, NY. QBSN will have you covered all throughout the game, from pre-game content, to post-game reactions!